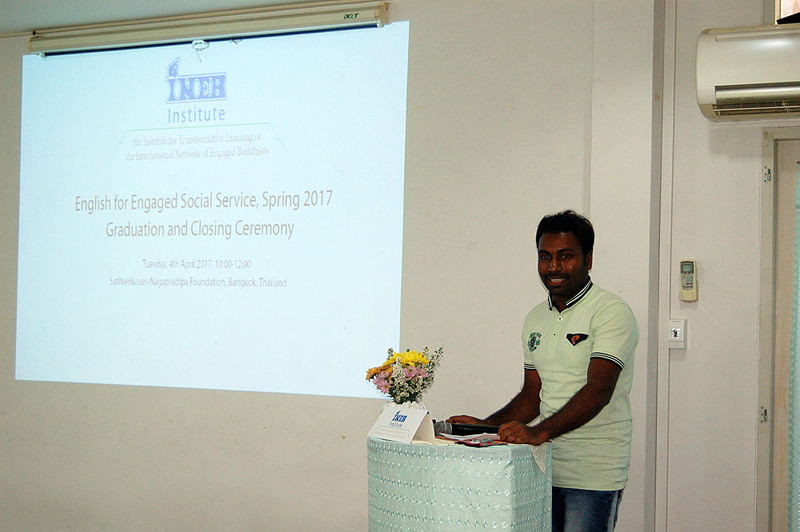 The INEB Institute’s English for Engaged Social Service 2017 program ended on April 4th of this year. At the graduation ceremony, our eight full-time students spoke about the impact of the course, and about the goals they had set for themselves. We share excerpts from the students’ presentations as a way of offering a brief initial report on this program. We wish to join the students in expressing our deep gratitude to the sponsors and to all who helped make this year’s program one that exceeded our expectations. Three months ago, I told my mom I was coming here to learn English. But in fact, I got to learn important truths about myself and the world through English. Those truths challenged me to design my life in a new way. I would like to share 5 things I discovered during this program. 1. What do I really want? The teachers gave me this powerful question. After I really thought about it, I found my goal: I want to live a harmless and simple life. 2. The social structure that I’m living in does not allow me to live simply, without harming others, or even myself. Oppression and exploitation occur every day, not only outside but also in my mind as patterns. To stop creating more suffering, I decided to stop blaming others or myself. 3. What I need to solve the problem is “understanding” and “connection”. To connect with myself, I will keep meditating. With my close ones, I will use co-counseling to free our minds from patterns. Through art, I connect with different groups of people in my society. And I want to practice mindful consumption to respect the environment. 4. English is power. With good English I can understand and connect to the world. To access knowledge and resources, be ready for cooperation, and contribute to my friends’ movements around the world, I will keep improving my English with joy. 5. Every time I feel discouraged, I will think of the fifth one that the teachers kept telling us: I’m important. What I do affects the world in some way. I can decide to be happy and begin anew every day. This is enough for changing my whole life. Thank you, all of you. 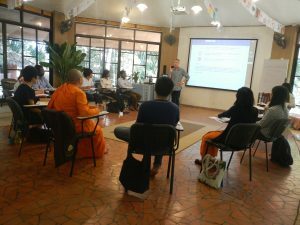 During this three-month course, I learnt many skills and subject areas, including meditation, power analysis, climate change and co-counseling. 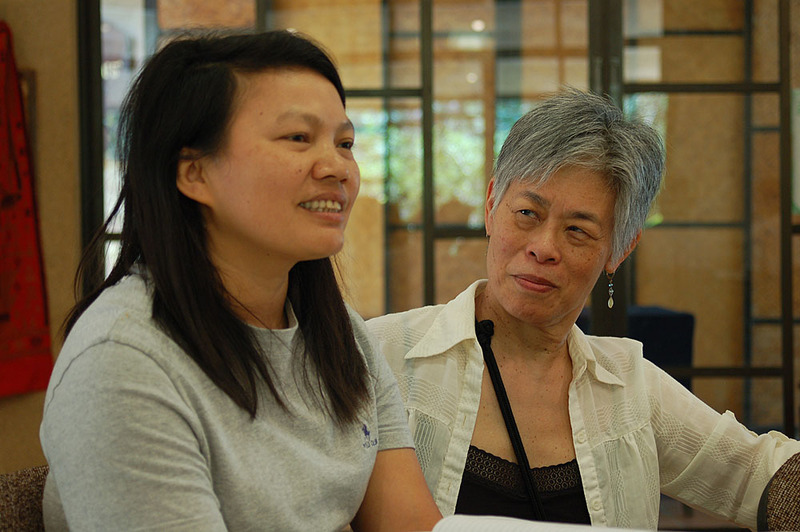 Co-counseling is a kind of deep listening that we practiced with each other almost every day. In the beginning, I didn’t like co-counseling. But after doing it more often, I realized that if we are honest and share our feelings with others, it is a way of being true to ourselves. And if we do that, we can understand other people more, and it helps us to have a clear mind. If everybody has a clear mind, our societies will be more beautiful and peaceful. 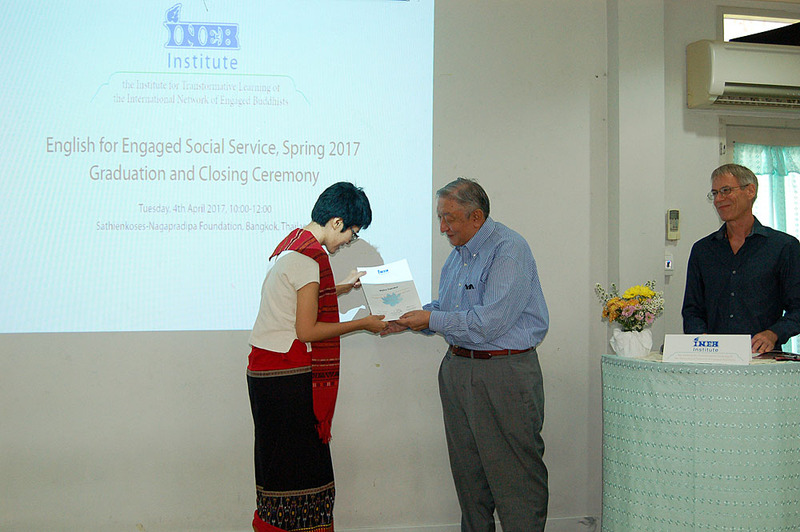 From this course, I was able to learn many tools of co-counseling, and it stimulated me to help my people to have a clear mind and a peaceful society. Furthermore, co-counseling is a powerful tool for improving our thinking and understanding of our world. In our culture, if we have a problem or get depressed, we try to control it by ourselves and keep it contained in our mind. We are embarrassed to show our emotions to other people because if we share our story with them, they usually don’t keep confidentiality. In some cases, it can even lead to suicide, or we may take it out on other people. Often it seems as if we are in pain and feel depressed because of what other people do. Actually, this is not a correct assumption. Therefore, I have decided to practice co-counseling in my environment because I know myself, and I know I also need a person who’ll listen to me carefully. Attending this program was one of my goals. I wanted to be an English student abroad and now my dream has come true. I have learnt a lot from this program. For example: my English skills are improving, I can understand more easily when people talk to me, and I speak and read English more clearly. Besides that, I have learnt about social structure, climate change, gender equality, and community actions through field trips and workshops. During this program my life has become more clear to me and I feel confident about what I want to do next. Here is one of my goals. 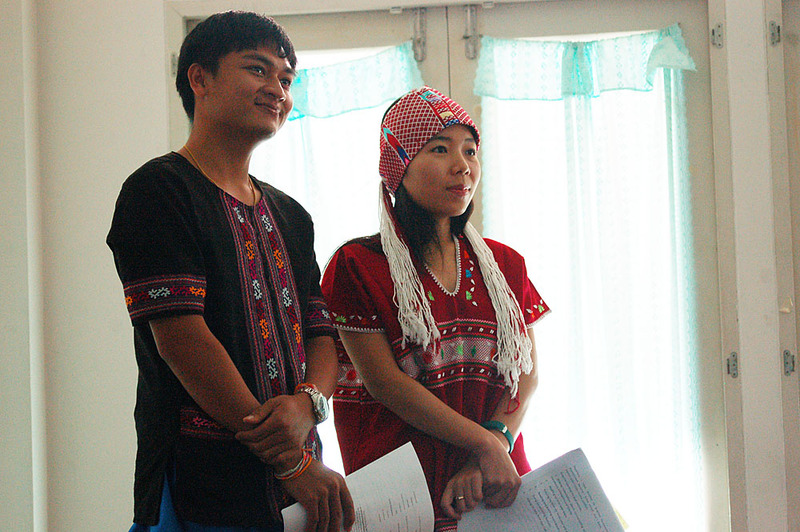 Within ten years, I want to open a learning center including English, volunteerism, Lao traditional dance, and social activism. I will open it in my hometown to help the younger generation in my village to have a chance to learn English. This course let me dare to dream of the high potentials that I could reach and showed me how to start step by step to make my goals come true. For the next 3 years, my goal is to apply for a scholarship for the study of Buddhism. My first concrete step to attain this goal is to write in English on the Facebook page of my monastery every day to make it bilingual in Thai and in English. My second step will be to focus on Buddhist teachings by reading several pages from a Dhamma book out loud every morning and recording it to listen to at night before I go to sleep. For my third step, I will search on YouTube for Dhamma talks from Buddhist monks and nuns who are English speakers from different sects. The fourth step is that I will take an online TOEIC test every week to check my progress. Over the next 5 years I will work to receive a scholarship in Buddhist Studies for my PhD. I also plan to give Dhamma talks in English and make them available to all those interested. My goal is to teach Buddhism in a university and to publish my English Dhamma talks online, on YouTube, and on our website. Within 10 years my goal is to open a Bhikkhuni International University in Thailand to assist the Bhikkhuni sangha not only in Thailand but also around the world. 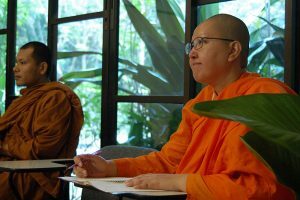 Bhikkhunis’ education and self-improvement requires studying what the Buddha taught and developing the ability to spread the Dhamma so as to heal the suffering of human beings in this world. I learned a lot in this program, not just English. We were provided many workshops related to various social issues. We went on field trips to many places and we met with famous Buddhist monks and leaders. This was a great opportunity for me. From the field trips I got knowledge related to Buddhism and leadership skills. This program was very effective for me because it provided knowledge and experiences that are useful and that I can apply to my humanitarian response work. Before this program, I had many goals and I wanted to do many things but I didn’t know how to start or how to achieve my goals. Now, from this program, I got ideas about how to start on my personal goals. When I go back home I want to continue my English learning. And then I’m going to share experiences from this program with my colleagues, especially related to power structures, co-counseling, and climate change. I want to start to do counseling for Internally Displaced Persons (IDP), because now they face deep suffering and have psychological pain because of the civil war in my area, Kachin State. During these three months, the level of my self- confidence has gone up. My English skills have also improved. So, I can say this program is a part of my life. Thank you very much. I came here to develop my English skills. But in this course I not only learnt English but also about society, climate change and Buddhist social action. This course inspired me a lot. When I go back to India, first I will share my experience and teach about global warming in my NGO institute. When I came to this program my thought was that I wanted to earn more money, I wanted to buy a car. I also wanted to help poor people’s education and health. These were my aims. When I came here I learnt about racism, gender inequality, casteism, co-counseling, meditation, Tai Chi, global warming, and other areas. floods, and drought. I decided that I have to work to protect the environment by protecting natural resources. First I want to develop my village by planting trees and raising awareness about solar energy and climate change. Then I plan to form a group of friends to start a campaign about global warming and planting plants along the roadsides. We also need to help protect agriculture and the diversity of livestock for future generations. We have chosen to protect the identity of two of our students, given the sensitive political situations they come from. They both wrote strong statements about their goals. One of these students wants to start a school that will educate the local community both in English and in the traditional language. The other has already begun translating texts in English into the local language and vice versa, creating new avenues for language study. 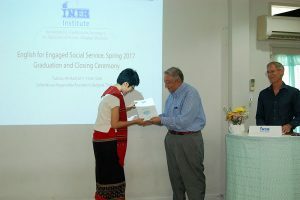 Both see English as a tool of empowerment that facilitates a broader connection with the wider world.